This is a coding diary rather then a sub-section. It helps me keeping track of useful tips and chunks of code I stumble across during my research and/or for fun. Each post can be accessed through the menu on your left. ArcGis and QGis are amazing pieces of softwere. However, there is a relatively steep learning curve that you might not necessarily want to walk on right away. If you are familiar with R, dplyr, and ggplot producing high quality maps using shapefiles is pretty straightforward. The folloging example is based on a municipal shapefile you can download on the ISTAT website, as a zipped bundle. If you ever use this code for your own research, would you mind citing this page? # Always set seed for reproducible examples. # After having read the data, have a look at its structure. In RStudio just click on the object you have just created. # Putting in region (`COM`) is important because it defines each id. # We going to create a vector of 8094 random values (one per each Italian municipalities) that we will use to colour our map. # In this case I'm asking R to draw 8094 numbers from a normal distribution with a mean = 100 and a standard deviation of 10. # taken from the muni_map data.frame. Raster maps, are another cool example of what - amazing - things you can do in R. Say that you have downloaded a massive data set containing 0.5 x 0.5 (or whatever else) gridded data and you would like to get a map out of it. 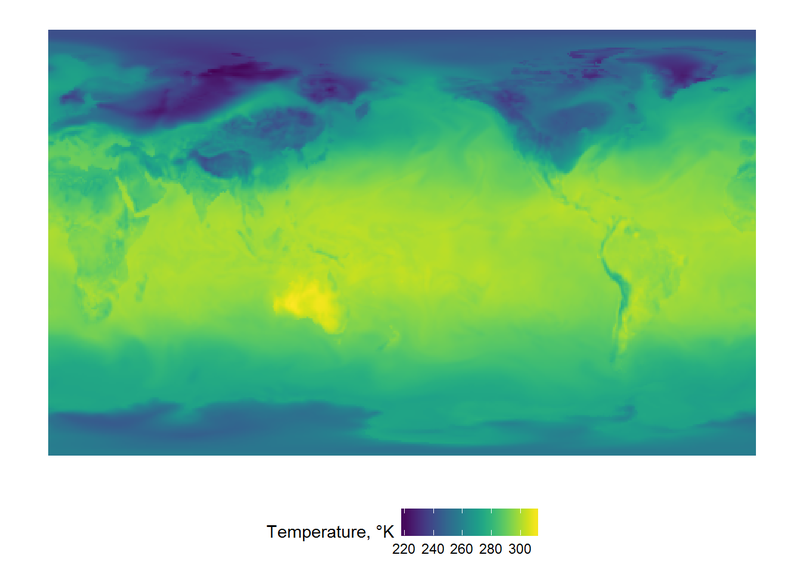 In general, when reading meteorological files into R, you usually end up dealing with lists of matrices whose rows represent latitute - going from - 90 to 90 by 0.5 - and columns represent latitude - going from - 180 to 180 or from 0 to 360. As an example, you can download this .csv file. It is a long-lat matrix that represents the 2 metre temperature of the globe recorded by ECMWF on January 1st, 1979. # When you have data in that format you just need to melt it and use ggplot to create your map. # words, it recreates all the possible long-lat pairs, fit them into 2 colums, and then store temperature values in a third one. Historical censuses, statistical yearbooks, and the like could be a goldmine for researchers. Nevertheless, it is often the case that hidden gems require an impressive amount of time - and funding - to be digitised. Here is a (cheeky) way of scraping data off pdfs, provided that some sort of text has been already coded into them. # with the usual list syntax. # I lapply() f to each page and get a list of 10 data.frames - that I give names to, for simplicity. # The last trick is to write different .csv files for each page, again using lapply. The output still requires to be cleaned but you won’t have to copy it ypurself! What happens when there is absolutely no text embedded into a pfd? Well, you can use OCR, i.e. Optical character recognition! This technology is quite fun - and often impressive. Here is a basic example of how to perform good quality OCR in R, free of charge. # when dealing with this format. In my own experience, OCR performs a lot better when given two, essential, pieces of information: - A language; - A set of characters to look for. Say that you want to OCR a table. Letters and numbers might be tricky to distinguish. In this case, I set the language to english and use the tessedit_char_whitelist option to tell R that he is dealing with a table containing numbers only. # Then use cat(data) to see what the result is. You can easily extract tables and transfer the output to a .csv. You can use the following when reading and binding all the files in a given folder. In this case I’m (f)reading large .csv files before binding them together. When dealing with basic string manipulation, you can - and probably should! - also use the stringr package. It’s pretty handy if you want to quickly remove/keep/repalce all the blanks, punctuation signs, digits, alphanumeric characters etc.